Posted by ゆのじ on 月曜日, 5月 28th, 2007 at 17:26:24. Thanks for figuring this out. 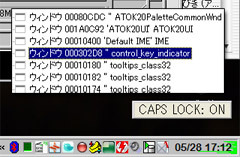 The status change indicators annoyed me as well, I found the control_key_indicator window as well but couldn’t figure out which process it was attached to. Anyways, it’s sorted now, thanks. unos.biz is proudly powered by WordPress.